Ever tried to make your way around a treatment menu? Struggling to understand what treatments are for? Don’t know how to pick the best treatment to suit you? Here’s how to choose the right treatment and get the best out of your spa experience. A – Aloe Vera skin treatment. Popular in the spas’ of Bali, Aloe Vera is a wonder plant. Its’ cool, thick gel works wonders on any type of skin, especially sensitive and sun-damaged. If you’ve been on the beach too long and your skin is red and dry, opt for this choice and give thanks as the aloe vera takes the sting out of the sunburn and re-hydrates skin. B – Balinese Boreh. A traditional favorite for the rainy season, a concoction of warming spices are blended into a stimulating body scrub. Black and white pepper, cinnamon and cloves are typical ingredients. Effective against any bodily cold condition such as arthritis, it can ward off a flu’ or cold if used in the early stages. C – Crystal Healing. Crystals are small chunks of rocks which were formed millions of years ago by an ultra-slow process of liquid magma cooling into a geometrically regular structure. They come in all shapes, sizes and colors and can transmit, focus, transmute, amplify, cleanse, filter, unblock, store and radiate energy. Crystals work on all levels of being, body, mind and spirit. During a healing session crystals will be placed on or around the body to help focus energy in the area it is needed. D – Detoxification. The process which occurs when stored toxins in the body are released from the tissues and sent via the bloodstream to the large intestine, kidneys and skin to be removed from the body. Detoxification is stimulated by massage. To help the process we should always drink plenty of water after a treatment. E – Energy. E= mc2, Prana, life-force, chi, ki, universal energy, call it what you will, but there undoubtedly exists a subtle energy that flows through our bodies. At times the chakras (main stations) and meridians (channels or tracks) can become blocked causing congestion and eventually illness in the physical body. Energy treatments such as reiki and shiatsu work with universal energy to unblock stuck energy and also to heal bodies on physical, mental, emotional and spiritual levels. F – Fitness. Often to be found in conjunction with spa. Fitness includes personal sessions at the gym, swimming, yoga and pilates, as well as trekking, biking and any other activities which work on cardio-vascular health. G – Gratuities. If your bill already includes service charge then you have automatically paid 10% of your treatment price to a fund which is split between all staff members at the end of every month. If you would like to reward a particular member of staff that gave you good service, then rule of thumb is to offer them around 10% of the treatment price. H – Hair-Cream Bath; a traditional hair treatment. The therapist will wash the hair and then apply a thick nourishing conditioner. Left on the hair for at least ten minutes, the conditioner will penetrate the hair shaft leaving the hair stronger and softer. I – Indonesian Massage. With a long history of healing and a natural ability for selfless touch, the Balinese massage uses long deep strokes to release muscle tension and give a sense of relaxation. A good medium pressure massage to try for those who are new to treatments. J – Jamu; Traditional Indonesian medicine. Fresh local herbs and spices are carefully prepared into drinks, lotions and potions and prescribed to cure health conditions and as a preventative measure. Try the fresh turmeric juice as a cure-all, it is anti-viral, anti-bacterial, anti-fungal and anti-septic. K – Kneipp Therapy. The use of hot or cold water to improve circulation and stimulate toxin removal. The guest stands in a wet room and the therapist hoses them in a specific sequence. L – Lomi Lomi Massage. Originated in Hawaii but popular on the menu’s of Bali. The masseuse uses the forearms and elbows to get deep into tissues. Rhythmical rocking motion coupled with long broad stokes help keep the treatment relaxing. M – Mandi Lulur. 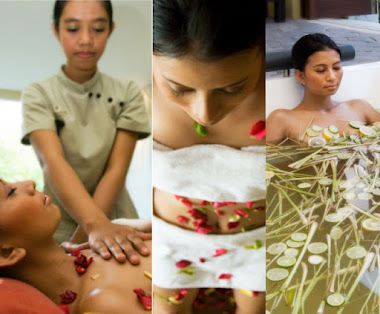 Typical bath treatment which originated in the Javanese palaces, princesses would take this treatment to prepare themselves for their wedding day. A lulur scrub consisting of finely-powdered rice, turmeric, jasmine and sandalwood is used to slough away dead skin cells, bringing forth fresh, new skin. Yoghurt is applied to soothe and cool, before a final moisturizer nourishes the skin. Positive skin luxury. N – Nurturing. Whether by pampering or therapeutically we can expect to feel nurtured when we leave a spa. To be nurtured is to be given attention, to be cared for. This is an essential element of good spa service, from the greeting upon arrival to the personalized touches during a treatment. O – Organic products. A product which has been produced in an environmentally-friendly way and is chemical-free. Organic products are pure and natural, smell better, feel better and are not going to damage your body by bringing you into contact with chemicals. P – Pain. A tight muscle may feel painful when it’s being released. If the muscle fibers have become knotted they will hurt when they are being worked upon, but try to go with it in order to get the later benefits. However, if something is too painful to bear then ask the therapist to stop that move and go on to the next. Generally there should be no pressure on top of prominent bones, except briefly on acupressure points, no pressure on soft tissues like the back of the knee cap, and no pressure on any delicate areas like groin, eyelids, throat etc. Q – Questions. Ask the spa staff which treatment they can recommend for you. They should ask about your history, whether you’ve had treatments before, if you have any injuries, what part of your body needs work, what type of pressure you like. Listen to their suggestions to make the right choice. R – Reflexology. A popular treatment world-wide which works mainly on the feet and lower legs. Based on the principle that all energy meridians and nerves in the body have a corresponding point on the foot. The therapist will use thumb or finger, or even a specially made wooden stick, to stimulate reflex points which work on the equivalent organ or area of the body. A very therapeutic treatment which is too strong for pregnant women. S – Shirodhara. An Ayurvedic treatment taken from the ancient Indian system of medicine which is based on over 5,000 years of knowledge and healing. A short massage relaxes and prepares the body. Lying on the back, a steady stream of warm, herbal oil is poured onto the forehead. 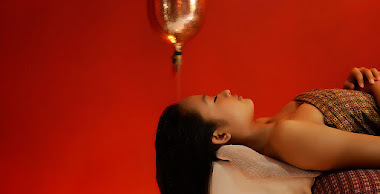 Amazingly relaxing, shirodhara is good for headaches, stress and poor sleep patterns. T – Thai Massage. 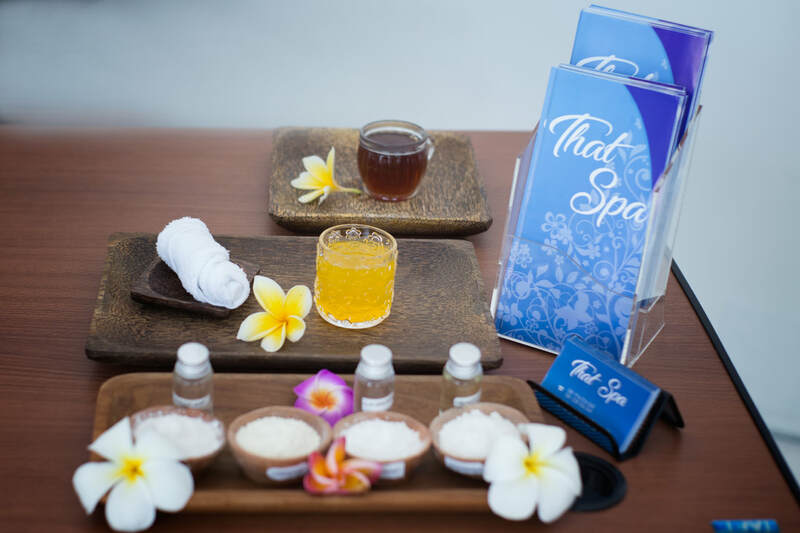 Originating in Thailand as the name suggests, this massage is oil-free and the guest will be asked to wear a special pair of pyjama’s. The therapist will maneuver the guest into various positions, stretching out their limbs and muscles. Subsequently these movements open blocked energy channels allowing subtle energy to flow freely along the body’s meridians. U – Unsatisfied. What do you do if you didn’t enjoy your treatment? Then make a complaint to the spa manager. Let them know in a constructive way that you did not get the results that were promised in the literature or you could have reasonably expected. Come to a fair compromise on a discount or full rebate on your treatment cost. V – Volcanic Clay Treatment. Volcanic mud is full of nutritive elements including sulphur (which gives the mud its odd smell) magnesium, calcium and phosphorous. When applied to the skin these elements are absorbed through the skin and leech out toxins, bind with them and render them able to be passed out of our bodies. Additionally they provide the body with a source of much-needed minerals. W – Watsu. A water-based therapy. The water will support your body as your therapist glides you around and moves your limbs into different positions. Great for those with joint problems as the cushioning-power of the water allows you to relax and flex a little more than in a usual massage. X – X-rated. Take care when choosing your spa as some are nothing more than a cover for something a little less savory. A spa should be a genuine place of healing any attempt to offer you services of a sexual nature should be politely rebuffed. Y – Yoga. The ancient practice of mind and body union. Guru’s used to practice yoga to prepare themselves before long stints of meditation. Nowadays yoga can be used to help the body stay flexible and healthy, quiet the mind and control emotions and keep us in touch with our own spirit and universal energy. By moving the body into various positions (“asana’s”) yoga is a holistic exercise which is gentle on joints and can also provide a cardiovascular workout. Z – Zen. Stresses the personal experience of enlightenment based on a simple life lived close to nature and through the use of meditation.